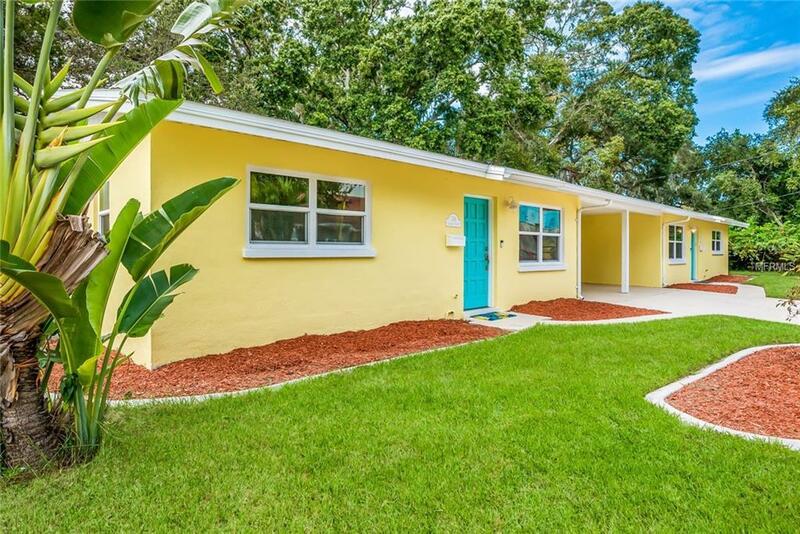 Welcome to this quaint and lovely income-producing duplex in the heart of Laurel Park located just steps from the arts and entertainment district of downtown Sarasota. The options are endless for this property, whether keeping it as an investment property or the setting of your future new home (or two). The property can be split into two buildable lots (5,000 SF and 5,511 SF). Both units have been updated. The south unit has a brand-new kitchen, cabinets, tile backsplash, butcher-block countertops, and new stainless steel appliances including microwave, range, dishwasher and refrigerator. Recessed LED lighting is found in the kitchen and living room. The bathroom has been tastefully updated with a newly tiled walk-in shower and vanity. The north unit is stylishly retro with new appliances and a clean yet original Florida feel. New impact windows, terrazzo floors, a separate laundry room with washer and dryer, and separate screened porches overlooking the backyard are some of the highlights of this truly unique and wonderful property.